Manuscripts must be written in current English or Portuguese. Non-native English speakers should ask a native specialist in medical English for checking the grammar and style. Either American or British English may be used but should be consistent throughout the manuscript. A submission letter signed by all authors must accompany each manuscript. This letter must state that: a) – the paper or portion thereof have not been previously published and are not under consideration by another Journal, b) – that all authors have contributed to the information or material submitted for publication, and that all authors have read and approved the manuscript, c) – that the authors have no direct or indirect commercial financial incentive associated with publishing the manuscript, d) – that the source of extra-institutional funding, specially that provided by commercial companies, is indicated, e) – that the study had been reviewed and approved by a certified Ethical Board or Committee, including the nmeber of the approval dociment and the date of the approval, f) – a non-plagiarism statement ( I (We) declare that all material in this assignment is my (our) own work and does not involve plagiarism), g) – Clinical trials must be registered on any Clinical Trials Registry and the letter must bring the number of registration and the name of the registry. After accepted for publication, the manuscript will become property of the International Braz J Urol. Conflict of Interest – Any conflict of interest, mainly financial agreement with companies whose products are alluded to in the paper, must be clearly disclosed when submitting a manuscript for review. If accepted, a disclosure will be published in the final manuscript. The requirements for authorship and the general rules for preparation of manuscripts submitted to the International Braz J Urol are in accordance with the Uniform Requirements for Manuscripts Submitted to Biomedical Journals (International Committee of Medical Journal Editors. Uniform Requirements for Manuscripts Submitted to Biomedical Journals. Ann Intern Med, 126: 36-47, 1997). An electronic version of the Uniform Requirements is available on various websites, including the International Committee of Medical Journal Editors web site: www.icmje.org. In response to the concerns of the editors of scientific medical journals with ethics, quality and seriousness of published articles, a Committee on Publication Ethics (COPE) was established in 1997 and a guideline document was published. 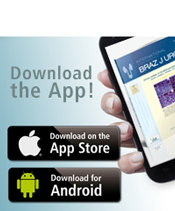 The International Braz J Urol signed, approved, and follows the COPE guidelines. The Editor strongly encourages the authors to carefully read these guidelines before submitting a manuscript (www.publicationethics.org.uk/guidelines or www.brazjurol.com.br, vol. 26 (1): 4-10, 2000). Peer Review – All submissions are subject to editorial review. Typically, each manuscript is anonymously forwarded by the Editor to 4 Reviewers (at least 2). If the Editor receives conflicting or inconclusive revisions, the manuscript is always sent to 1 or 2 additional Reviewers before the Editor’s decision. If considered necessary by the Editor or by the Reviewers, statistical procedures included in the manuscript will be analyzed by a statistician. 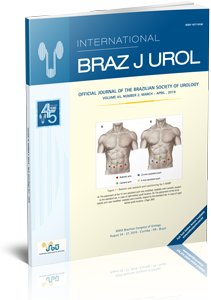 The International Braz J Urol contains six sections: Original Articles, Review Articles, Video Section, Radiology Page, Surgical Techniques and Challenging Clinical Cases. The articles should be written in Portuguese or English official orthography. Abbreviations should be avoided, and when necessary must be specified when first time mentioned. Unusual expressions may not be used. A list of abbreviations must be provided at the end of the manuscript. Every manuscript submitted to publication should have a cover page containing the title, short title (up to 50 characters), authors and institution. Up to six key words should be provided. These words should be identical to the medical subject headings (MeSH) that appear in the Index Medicus of the National Library of Medicine (http://www.nlm.nih.gov/mesh/meshhome.html). One of the authors should be designated as correspondent and the complete correspondence address, telephone and fax numbers and E-mail should be provided. If any financial support has been provided, the name of the institution should be mentioned. Original Articles: Original articles should contain a Cover Page, Abstract, Introduction, Materials and Methods, Results, Discussion, Conclusions, References, Tables and Legends, each section beginning in a separate page and numbered consecutively. Original articles should cover contemporary aspects of Urology or experimental studies on Basic Sciences applied to urology. The manuscript text should contain no more than 2500 words, excluding the Abstract. The number of authors is limited to five. References should contain no more than 30 citations, including the most important articles on the subject. Articles not related to the subject must be excluded. Review Articles: Review articles are accepted for publication upon Editorial Board’s request in most of the cases. A Review Article is a critical and systematic analysis of the most recent published manuscripts dealing with a urological topic. A State of the Art article is the view and experience of a recognized expert in the topic. An abstract must be provided. International Braz J Urol requires a completed PRISMA checklist and flow diagram as a condition of submission when reporting findings from a systematic review or meta-analysis. Templates for these can be found here or on the PRISMA website which also describes several PRISMA checklist extensions for different designs and types of data beyond conventional systematic reviews evaluating randomized trials. At minimum, your article should report the content addressed by each item of the checklist. Meeting these basic reporting requirements will greatly improve the value of your review and may enhance its chances for eventual publication. Surgical Technique: These manuscripts should present new surgical techniques or instruments and should contain Introduction, Surgical Technique, Comments and up to five References. An abstract must be provided. At least five cases performed with the technique must be included. Challenging Clinical Cases: These manuscripts should present relevant clinical or surgical situations which can bring or consolidate our understanding of genesis, natural history, pathophysiology and treatment of diseases (More information). The number of authors is limited to three. – Case(s) hypothesis and rational: precepts, clinical and basic reasoning supporting the case(s) hypothesis and the raised scenario. Why is it important and is being reported? – Number of references: 10-15. Radiology Page: A typical patognomonic image, be it an ultrasonography, computed tomography, X-ray, magnetic resonance imaging, etc., followed by a explanatory text. Maximum length: 300 words text and no more than 10 references. Will be published upon the Section Editor decision. Video Section: The material must be submitted in the appropriate local, in the Journal’s site, where all instructions may be found (Video Section link). Letters to the Editor: The letter should be related to articles previously published in the Journal, should be useful for urological practice and must not exceed 500 words. They will be published according to the Editorial Board evaluation. The illustrations should not be sent merged in the text. They should be sent separately, in the final of the manuscript. 1) The number of illustrations should not exceed 10 per manuscript. 2) Check that each figure is cited in the text. 3) The legends must be sent in a separate page. 4) The legends of histological illustrations should contain the histological technique and the final magnification. 5) The International Braz J Urol encourages color reproduction of illustrations wherever appropriate. 6) All histological illustrations should be supplied in color. 1) Do not embed the figures in the text, but supply them as separate files. Supply photographs as TIFF (preferable) or JPG files. The TIFF of JPG should be saved at a resolution of 300 dpi (dots per inch) at final size. If scanned, the photographs should be scanned at 300 dpi, with 125mm width, saved as TIFF file and in grayscale, not embed in Word or PowerPoint. Line drawings must be supplied as EPS files (give an EPS extension, e.g. Fig01.eps). Use black text over light to mid grey and white text over dark grey or black shades. Use lower case for all labeling, except for initial capitals for proper nouns and necessary mathematical notation. Centre each file on the page and save it at final size with the correct orientation. We recommend a minimum final width of 65 mm, but note that artwork may need to be resized and relabeled to fit the format of the Journal. b) DO NOT supply artwork as a native file. Most illustration packages now give the option to “save as” or export as EPS, TIFF or JPG. c) DO NOT supply photographs in PowerPoint or Word. In general, the files supplied in these formats are at low resolution (less than 300 dpi) and unsuitable for publication. d) DO NOT use line weights of less than 0.25 point to create line drawings, because they will nor appear when printed. TABLES: The tables should be numbered with Arabic numerals. Each table should be typed on a single page, and a legend should be provided for each table. Number tables consecutively and cites each table in text in consecutive order. • Paterson RF, Lifshitz DA, Kuo RL, Siqueira Jr TM, Lingeman JE: Shock wave lithotripsy monotherapy for renal calculi. Int Braz J Urol. 2002; 28:291-301. • Holm NR, Horn T, Smedts F, Nordling J, de la Rossete J: Does ultrastructural morphology of human detrusor smooth muscle cell characterize acute urinary retention? J Urol. 2002; 167:1705-9. • Sabiston DC: Textbook of Surgery. Philadelphia, WB Saunders. 1986; vol. 1, p. 25. • Penn I: Neoplasias in the Allograft Recipient. In: Milford EL (ed. ), Renal Transplantation. New York, Churchill Livingstone. 1989; pp. 181-95. The Int Braz J Urol has the right of reject inappropriate manuscripts (presentation, number of copies, subjects, etc.) as well as proposes modifications in the original text, according to the Referees’ and Editorial Board opinion. The Ideal Manuscript may not exceed 2500 words. The Title must be motivating, trying to focus on the objectives and content of the manuscript. Introduction must exclude unnecessary information. It should briefly describe the reasons and objective of the paper. Materials and Methods should describe how the work has been done. It must contain sufficient information to make the study reproducible. The statistical methods have to be specified. The Results should be presented using Tables and Figures whenever possible. Excessive Tables and Figures must be avoided. The tables should not be repeated on the text. The Discussion must comment only the results of the study, considering the recent literature. Conclusions must be strictly based on the study findings. References should contain no more than 30 citations, including the most important articles on the subject. Articles not related to the subject must be excluded. The Abstract must contain up to 250 words and must conform to the following style: Purpose, Materials and Methods, Results and Conclusions. Each section of the manuscript must be synthesized in short sentences, focusing on the most important aspects of the manuscript. The authors must remember that the public firstly read only the Abstract, reading the article only when they find it interesting. The on line journal has open and free access. Int Braz J Urol is published under the Open Access model and is therefore free for anybody to read and download, and to copy and disseminate for educational purposes. Articles will be published immediately after the final corrections of the master proof have been made. When posted online, articles will be assigned a DOI number (Digital Object Identifier) whereby it becomes possible to search and cite them without delay. The Open Access model used for Int Braz J Urol implies that production costs are covered by publication no fees normally paid for institution or authors. Recent issues of the International Braz J Urol must be observed concerning the presentation form of the manuscript.